When you look at your home, do you ever daydream about the improvements you want to make or daydream about the things you'd like to add to your home? I think about my porch and how I'd like to design it with a super cozy and inviting patio set, as well as some decor. My backyard...oh my...my backyard, I have so many ideas of what I'd like to do in my backyard. One day a deck, I've got my vegetable garden sorta started, we'll have a shed in July, and I really want to add some amazing landscaping. So far, I have a hammock. Well, a hammock and a half hearted vegetable garden. When I reached out to DFOhome.com to see if we could partner together to do a review, I wasn't even sure where I wanted to start with my backyard. I want it to be an oasis. Somewhat of a sanctuary. I want us to be able to go out to our backyard and know it's time to relax. 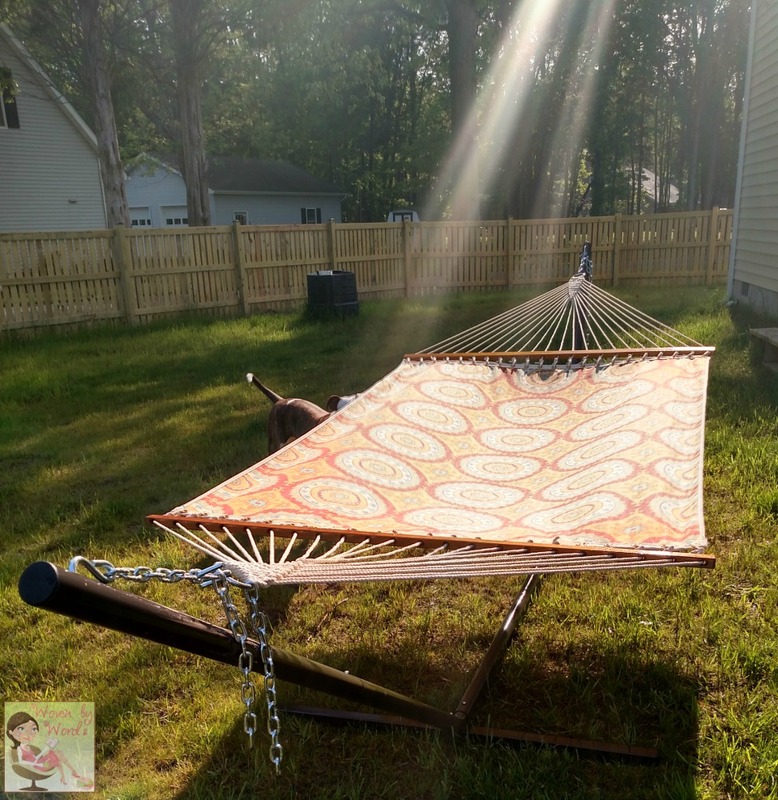 When DFOhome.com offered to have me review a hammock and a hammock stand, I was over the moon! I always thought a hammock was a major luxury! I have never slept in a hammock. Never. Not once. Can you believe it? Of course, I JUMPED at the chance. The hardest part of all of this was deciding on the fabric. If you've read other posts, you might realize that I'm not a fan of prints. In fact I have a strong aversion to them. lol For me, I went with the Inessa Sunset design. There was something that screamed "vacation" to me when I saw it! I loved the colors. May was spent with a wet month and I didn't have but ONE day to get the hammock up and photos taken before it rained again...for days! It was crazy. It took me maybe 10 minutes to get it set up. Probably five, but giving realistic room for more time. 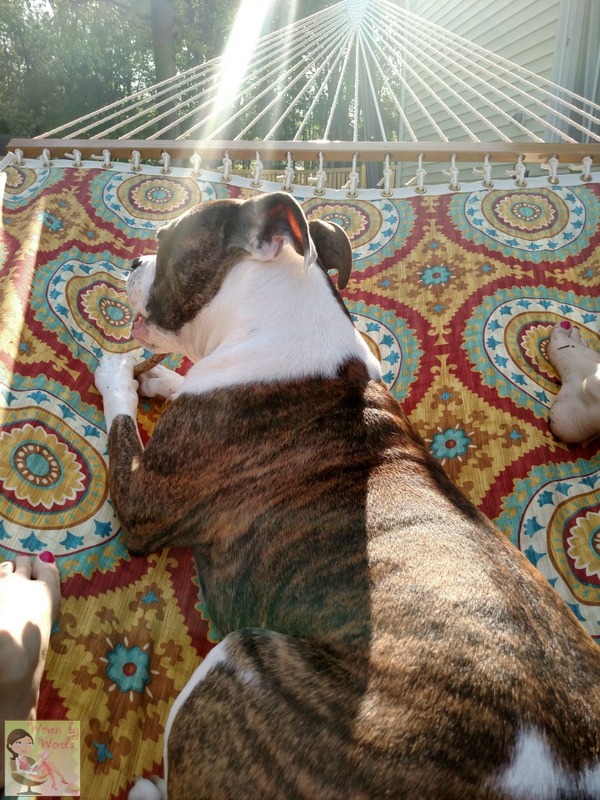 The day I got my brand new hammock up, Peru decided to lay claim to it. Claimed it with her darn stick! I was able to share it with her for a little bit before I had to get to work. The hammocks are sold separately from the stands. 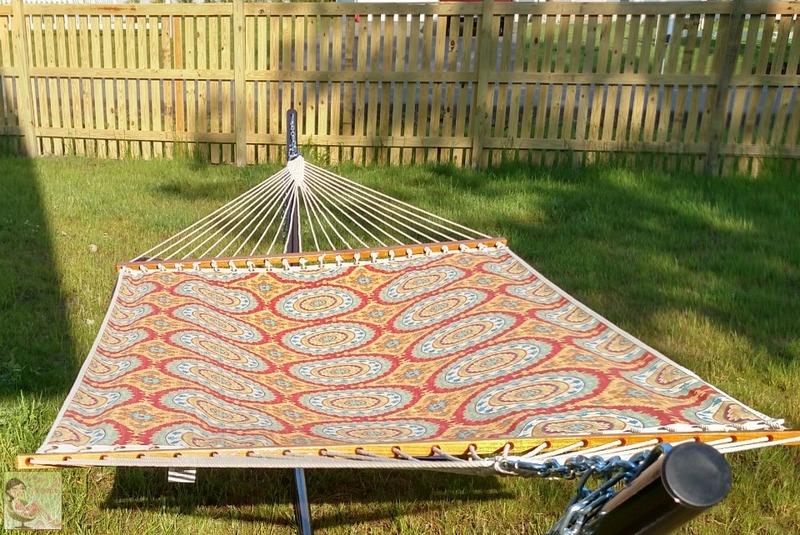 There are actually several different options when it comes to hanging your hammock. The first option is the tree hook. That's what came with my Inessa. The second option is tree straps. With straps, there's no drilling involved like there would be with the tree hooks. They're great to travel with, too! The third option is a stand. I love this option for at home hammocking. Yes, I totally just made that a word! I put the stand out, and hang my hammock whenever I get the notion. I've been bringing the hammock in when it's really cruddy weather, but you don't have to. The stand, it gets to stay right where it is. Not only that, we ended up not having trees in our fence line. The next time I got it up, I had my son come out and check it out. Well, the goofball dog tried to jump into it with him, and clotheslined herself, and flipped him out of it. hahahaha Oh dear that was amusing. That didn't deter my son from getting into it again, but this time without a dog. I had yet to enjoy the hammock on my own. When my hubby got his chance at the hammock, he made mention of having pillows to go with it. That was all the encouragement I needed to go online and buy not one, but two pillows! I told you, I want my backyard to be a sanctuary. I want to go all out when it comes to our enjoyment of that space. 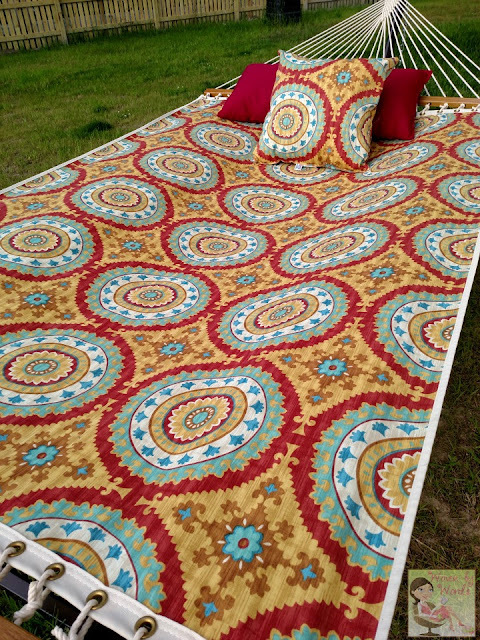 I purchased the matching Inessa Sunset pillow, and then a long burgundy one that would go almost the whole width of the hammock. I was shocked at how quickly they got to me! I immediately went out to enjoy my new purchase. All by myself I might mention. It didn't last more than a couple minutes. The next thing I knew, my youngest was out there cuddling with me. lol This mama never has time to herself. It's made to fit two, and it does so with lots of room. The brief moments I've had to myself, I've found the hammock to be incredibly comfortable. Comfortable that I highly expect to find myself taking naps in my backyard through the summer in it. When I was buying the pillows, I realized that there are table attachments for it! I had no idea that something like that would exist. I may need 2. One for my books and a drink, and one for a citronella burner to keep the pesky bugs away! 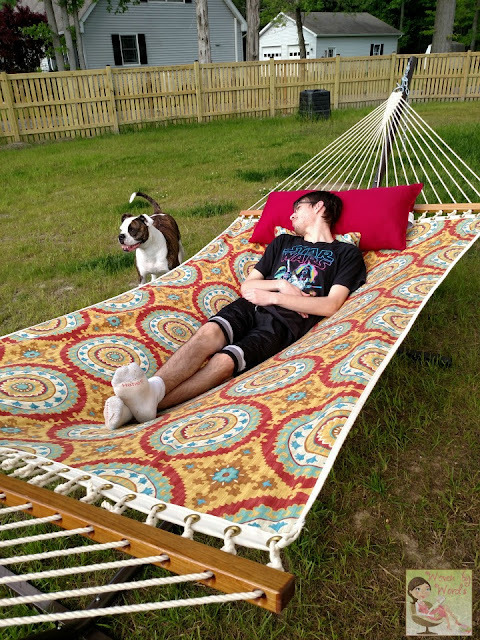 Keep an eye here because I'm going to be having an awesome giveaway package that will be including a hammock (different that the ones you see here) from DFOhome.com! You don't want to miss out! Be sure to follow them on all of their social channels: Facebook, Pinterest, Twitter, and Instagram! 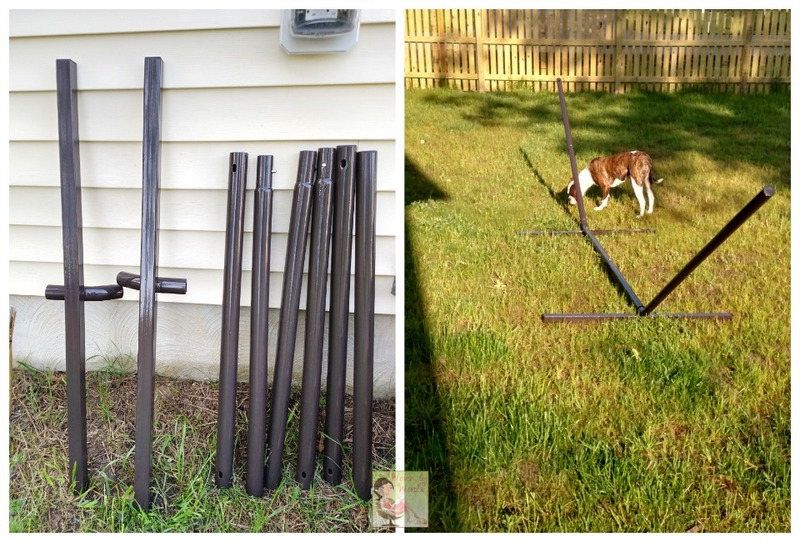 Get amazing inspiration for all of your outdoor designing! 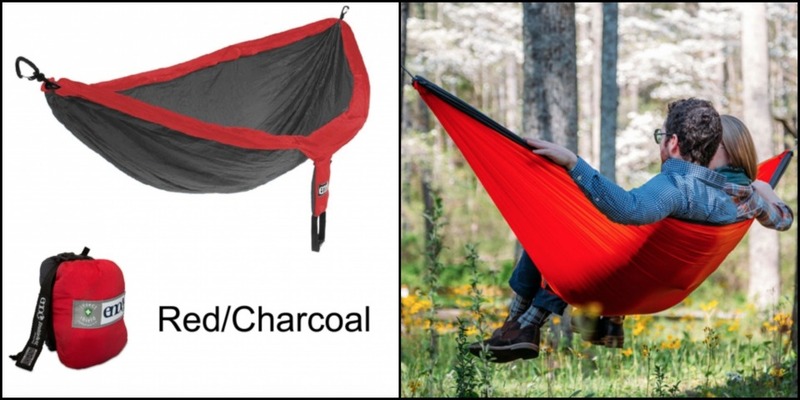 Where would you want your hammock: at home or on the go? These are really great looking hammocks, I especially like the sunset orange color. I think it's great that they are nice and wide too. Thanks for sharing these. These hammocks really look nice and made real good. I would like the purple one. This hammock looks and sounds wonderful. I know I would have to fight the grand kids over it. I would love to have one using the stand. That way, it could go anywhere in the yard. What a fun way to enjoy the outdoors together. Everyone should have a hammock. I would use it at home. It looks so relaxing! This hammock looks amazingly comfortable! :) I would probably use it the most as home, I'm a SAHM and it would definitely be a nice place for me to read and relax. 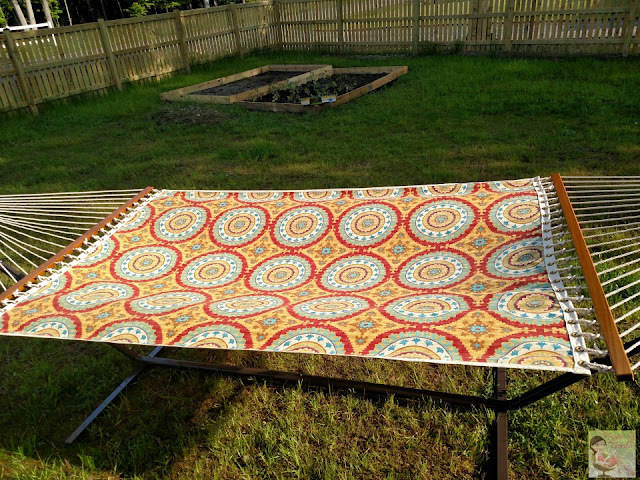 I love the pattern on this hammock! It also looks so relaxing! I would really enjoy this in my yard this summer. The pattern on the one you have is really pretty neat. Yep hammocks have a learning curve for sure :) I love that 2 person hammock. 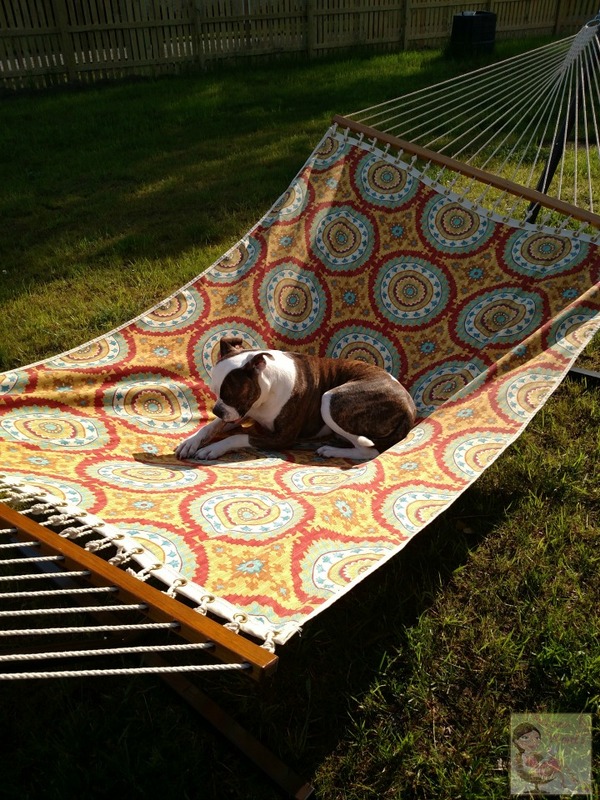 I would love one for the back yard and one for on the go- it looks so relaxing. I would want my hammock at home in the backyuard.